China has long struggled to contain separatist movements around its periphery. Until now, the Chinese Communist Party’s (CCP) focus has been on deterring activists and leaders in Tibet and the northwestern region of Xinjiang, while militarily dissuading Taiwan, where it has never held sway, from formalizing its independence. In Tibet and Xinjiang, the Party uses its traditional tools: restricting freedom of expression, censoring critical press coverage, locking up activists, and putting pro-establishment politicians in power. That calculus has now changed since the September 4th elections for Hong Kong’s Legislative Council — known colloquially as LegCo — where pro-democracy candidates made gains that have alarmed leaders in Beijing. Since reacquiring the former British colony in 1997, China has struggled to manage Hong Kong’s successful but outspoken civil society, many of whose members consider themselves culturally separate from the mainland. Under the conditions of the 1997 handover agreement, China has agreed to maintain a policy of “one country, two systems” until 2047. In the meantime, Hong Kong mostly retains its British-era electoral process, a convoluted system which — much to Beijing’s elation — strongly favors pro-establishment politicians. 35 of the 70 seats in LegCo are for “geographical constituencies”, geographic areas apportioned a number of seats based on their population with representatives elected by popular vote. The other half of LegCo’s seats, however, are controlled by “functional constituencies”, a convoluted system by which Hong Kong’s various business, government, and professional interests are apportioned seats. Including the five directly elected functional constituency seats for District Council (Second), 40 of LegCo’s 70 seats are meaningfully democratic. 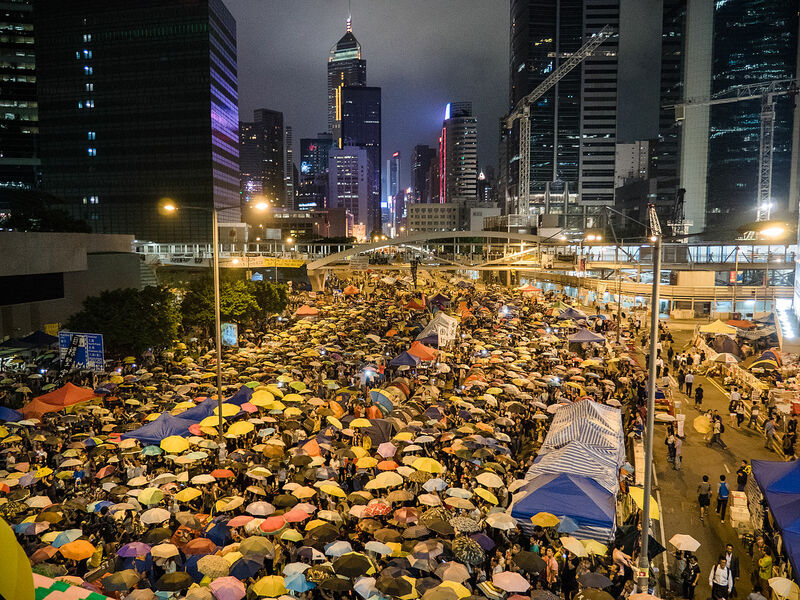 The September elections were the first to take place after the semi-failed 2014 “Umbrella Movement”, named after the protesters’ shields of choice to deflect pepper spray and tear gas. Since then, Hong Kong has been wracked by a series of scandals and protests, souring an already complicated relationship with the mainland. In 2015, five booksellers from an anti-Communist Party bookshop in Hong Kong’s Causeway Bay were allegedly abducted from Hong Kong and Thailand and imprisoned in mainland China. In February of this year, riots wracked the densely populated district of Mong Kok in a city where riots haven’t occurred in years. Beijing attempted and failed to modify the election of the Chief Executive to present voters with only a slate of Party-backed candidates, sparking the 2014 demonstrations. The head of operations at Hong Kong’s venerated Independent Commission Against Corruption was fired while investigating embattled pro-establishment chief executive Leung Chun-ying. Protests in front of government offices in the Admiralty district are still a common occurrence. In the runup to the election, establishment forces tried to disqualify several pro-democracy and pro-independence candidates, including requiring candidates to sign a pledge stating that they would recognize Hong Kong as an “inalienable” part of China. Several LegCo members-elect had their oaths rejected after intentionally modifying them; after LegCo president Andrew Leung Kwan-yuen allowed the oaths to be retaken, the pro-establishment camp staged a walkout. These heavy handed tactics may have backfired in the one corner of China where the Party has no official presence. Pro-democracy politicians now hold 30 of LegCo’s 70 seats, winning 55% of the vote in the geographical constituencies. But the development unnerving Beijing is not the marginal increase in pro-democracy politicians in LegCo, it’s the character of the new politicians being elected. For the first time, six candidates have been elected who openly call for — or at least accept the possibility of — Hong Kong’s independence from the mainland. These so-called “localists” represent a new, mostly young, radical element of the pan-democratic movement. Nathan Law Kwun-chung, an Umbrella organizer and now the youngest person ever elected to LegCo, is calling for a referendum on Hong Kong’s status after the current agreement expires in 2047. Meanwhile, Beijing has been mostly silent, perhaps reflecting divisions within the party on the issue. Broadly speaking, China must decide whether to fold its hand and preserve its remaining political capital to fight another day, or to double down on its traditional strong-arm tactics. Both options present risks. Pulling back may allow the current anti-mainland fervor to fizzle out. Not all localists are directly calling for independence; many suggest only Hong Kong’s right to self-determination. Joshua Wong, one of the leaders of localist party Demosisto and a former Umbrella organizer, argues that “If Hong Kong can enjoy the promised autonomy and democracy under Chinese rule, we wouldn’t need independence.” On the other hand, Beijing risks allowing localist elements to grow unchecked; election to LegCo has already offered the localists access to new funds and a larger platform. Worse, China has long worried about relatively free Hong Kong’s influence on the mainland, and tolerating democratic movements in Hong Kong risks allowing them to spread across the border. The incident with the booksellers in particular has already left many Hong Kongers on edge about their relationship with the mainland, and the elections bear out that such tactics have a political cost for the Party. And Beijing has more to lose with such tactics in Hong Kong, an internationally renowned and closely-watched financial hub, than it does in Xinjiang or Tibet. Many of the functional constituencies, associated with business and social groups, are supportive of Beijing only so long as they have something to gain from their relationship with the CCP in the city. A crackdown and resulting disruptions in Hong Kong may convince some that they have little left to gain in supporting such a situation, further eroding Beijing’s legitimacy. The path forward for localists and pan-democrats alike is far from clear. Beijing seems unlikely to back off. The pan-democrats 30 seats allow them to block pro-establishment politicians from enacting any major constitutional changes. But with many of the functional constituencies dependent on groups unlikely to cross Beijing, it will be a difficult for the pan-democrats to expand on their 55% share of the popular vote and acquire the 6 seats they would need to hold a majority. The path toward an independent — or even a fully democratic — Hong Kong is extremely fraught. Political will for independence is dubious: one poll by the Chinese University of Hong Kong shows support for independence after 2047 at 17%, with even fewer believing independence is actually possible. Even if the popular support existed, it’s unlikely Beijing would ever allow such a situation to materialize. Professor Yuchtman argues that a show of military force in Hong Kong is not credible, and therefore if Hong Kong ever approached independence, the Party would seek to negotiate a settlement. He also acknowledges, however, that “at every point in time when Xi Jinping had an opportunity to compromise and really diffuse the situation, he’s doubled down.” The Party demonstrated 30 years ago in Tiananmen Square that it was willing to take drastic measures to maintain power and has worked hard since then to head off challenges to its position before they come to such a dramatic head again. Hong Kong may one day come to resemble neighboring Shenzhen, with police, troops, and military hardware common sights on street corners. Still, the election of six localist candidates means that the drama of recent years has clearly made an impact on the electorate, especially the young: Professor Yuchtman’s research suggests that 40% of Hong Kong’s university students support independence. Time will tell if the legacy of the Umbrella Movement will find more success in the legislature than it did on the streets. Posted in World and tagged C.Y. Leung, hong kong, Joshua Wong, localists, Nathan Law, Umbrella Revolution, Xi Jinping. Bookmark the permalink.